The Ha Noi Police has recently apprehended a foreign – currency smuggling ring, arresting three people involved. Yesterday, the Hanoi Police Investigative Bureau issued indictment against Do Anh Duc, 25, residing in Phuc Tho of Ha Tay Province, Nguyen Huu Nguyen, 30, residing in Kim Thanh of the Hai Duong Province and Dang Van Ha, 33, residing Van Nam of Ha Tay Province. The three men have been charged with the circulation of counterfeit money. Preliminary investigations revealed that at the end of February 2007, Do Anh Duc and Dang Van Ha went to Mong Cai of Quang Ninh, a mountainous province located along the northeastern coast of Viet Nam, to buy counterfeit Hong Kong dollars and transported them to Ha Noi where they were exchanged for Vietnamese currency. Nguyen, Ha and Duc were reported to have gone to Mong Cai three times to buy 600,000 false Hong Kong dollars, worth VND1.2 billion. 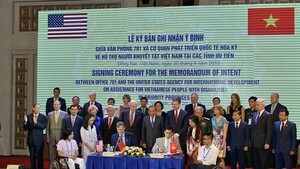 The money had been circulated in Ha Noi and exchanged at the foreign exchanges of a number of banks. Based on reports from victims who had bought the false Hong Kong dollars, the Police conducted investigations at the foreign exchange agents and intercepted the criminals. On March 8, Duc, Ha and Nguyen were arrested and 400,000 of counterfeit HK dollars were seized.